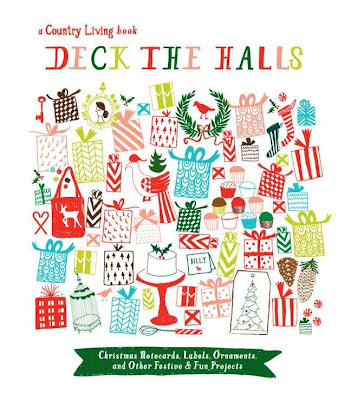 Country Living Deck the Halls will inspire your crafty side, and a joy of making handmade gifts you can share with family and friends this Christmas. Encouraging you to find vintage finds, items found in nature, or items found at your local five and dime, each chapter then ends with printed items to help complete your creative projects! Inspiration can be found in the kitchen, and with Country Living Deck the Halls, you can bake your Christmas gifts or make goodies for your home! You will find beautiful recipe cards and matching labels to make your food inspired gifts all the more festive! Have you ever wanted to make a gingerbread house? A template and little decor are items will make your gingerbread house easy to make and decorate, even for a first time baker! Bake this Holiday Season, and share the love from your kitchen. You will love the beautiful punch outs and stickers, that will assist you in making table settings and decorations that will leave your guests talking for years to come! You can craft your way through the holidays with the numerous projects that are included in Country Living Deck the Halls. Clear instructions, templates, and stunning photos will help or inspire you to create decorations you can pass down to your children! Look for new and useful ways to use the items or collections you love to set your table or mantle, with splashes of color and sparkle! Many, many ideas will send you running for the nearest pair of scissors, paper, and craft items that will complete your list of Christmas crafts. Country Living Deck the Halls can be found at major book retails and on Amazon, and would make a great gift or coffee table book for any craft diva or baker! Stuffed with do-it-yourself Christmas gifts, crafts, and decorations, Country Living Deck the Halls (October 2012, Hearst, 9781588169235) is the perfect all-inclusive package. Author Katy McColl is the former Executive Editor of O at Home (Oprah Winfrey's home magazine) and Country Living. Her work has appeared in the New York Times, Travel & Leisure, CBS Moneywatch.com, Best Life, Page Six Magazine, Blueprint, InStyle Home, and other publications. *I was not compensated for this review, all thoughts and opinions of the book are 100% my own.